In this Vietnamese name, the family name is Nguyễn. According to Vietnamese custom, this person should properly be referred to by the given name Thơ. 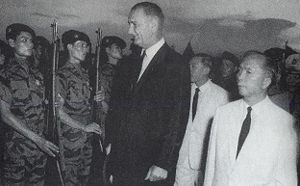 US Vice President Lyndon B. Johnson (centre) and Nguyen Ngoc Tho (far right) review ARVN marines at Tan Son Nhut Air Base. Nguyễn Ngọc Thơ (born May 26, 1908) is a Vietnamese politician who was the first Prime Minister of South Vietnam, serving from November 1963 to late January 1964. Tho was appointed to head a civilian cabinet by the military junta of General Duong Van Minh, which came to power after overthrowing and assassinating Ngo Dinh Diem, the nation's first president. Tho's rule was marked by a period of confusion and weak government, as the Military Revolutionary Council and the civilian cabinet vied for power. Tho lost his job and retired from politics when Minh's junta was deposed in a January 1964 coup by General Nguyen Khanh. The son of a wealthy landowner, Tho rose through the ranks as a low-profile provincial chief under French colonial rule. Following World War II, he became the Interior Minister in the French-backed State of Vietnam. After the establishment of the Republic of Vietnam following the partition of Vietnam, Tho helped to dismantle the private armies of the Hoa Hao religious sect. This earned him the vice presidential role, which was given in order to widen the popular appeal of Diem's nepotistic regime. Tho was not allowed to take part in policy decisions and had little meaningful power, as Diem's brothers, Ngo Dinh Nhu and Ngo Dinh Can, commanded their own private armies and secret police, and ruled arbitrarily. Tho oversaw South Vietnam's failed land reform policy, and was accused of lacking vigor in implementing the program because he was a large landowner. He was noted for his faithful support of Diem during the Buddhist crisis that ended the rule of the Ngo family. Despite his own Buddhist background, Tho staunchly defended the regime's pro-Roman Catholic policies and its violent actions against the Buddhist majority. The son of a wealthy southern landowner, Tho was born in the province of Long Xuyen in the Mekong Delta. He began his bureaucratic career in 1930, serving the French colonial authorities as a low-profile provincial chief. Following World War II, Tho became Interior Minister in the French-backed State of Vietnam under the puppet Emperor Bao Dai. Following the withdrawal of France from Indochina after the Battle of Dien Bien Phu, Vietnam was partitioned into a communist north and anti-communist south. Following the proclamation of the Republic of Vietnam under Ngo Dinh Diem, commonly known as South Vietnam, Tho was appointed the inaugural ambassador to Japan. Despite spending most of his time in Tokyo confined to his bed by a fractured hip, Tho secured reparations from Japan for its imperial occupation of Vietnam during World War II. In May 1956, Diem recalled him to Saigon to help deal with the Hoa Hao, a religious sect equipped with a private army. The Hoa Hao was effectively an autonomous entity in the Mekong Delta, as its private army enforced a parallel administration and refused to integrate into the Saigon administration. While the Army of the Republic of Vietnam (ARVN) General Duong Van Minh led the military effort against the Hoa Hao, Tho helped to weaken the sect by buying off its warlords. During this period, he acted as the Secretary of State for the National Economy. In November, Diem appointed Tho as vice president in an effort to widen the regime's popular appeal. The appointment was endorsed by the National Assembly in December 1956, in accordance with the constitution. The move was widely seen as attempt to use Tho's Mekong Delta roots to increase the government's popular appeal among southern peasants, because Diem's regime was dominated by family members, who were minority Roman Catholics from central Vietnam. Ngo Dinh Diem (pictured), the President of South Vietnam. Despite the importance of his title, Tho rarely appeared with Diem in public and was a figurehead with little influence. The real power lay with Diem's brothers Ngo Dinh Nhu and Ngo Dinh Can, who commanded private armies and secret police, as well as giving orders directly to ARVN generals. Nhu once ordered a bodyguard to slap Tho because he felt the vice president showed him a lack of respect. Diem held Tho in contempt and did not allow him to take part in policy decisions, despite his position which theoretically made him the second most powerful man in the country. Tho had a rapport with the military officers, having befriended Minh after helping to secure his release from a French prison years earlier. Tho was charged with overseeing South Vietnam's land reform program, because the minister of agrarian reform, Nguyen Van Thoi, answered to him. As both men were wealthy landowners, they had little incentive for the program to succeed. The US embassy received angry criticism of Tho's lack of enthusiasm towards implementing the policy, stating "he is most certainly not interested in land distribution which would divest him of much of his property." Although a Buddhist, Tho had a reputation for heaping praise on Diem's Roman Catholic government. On Diem's 62nd birthday, Tho paid tribute, saying "thanks to the Almighty for having given the country a leader whose genius was outweighed only by his virtue." (Buddhism is a Dharmic religion which does not recognize a supreme being in a theistic sense.) Tho later accompanied Diem to the Roman Catholic Redemptorist Church to pray for the President. Tho had little public following, with American Chairman of the Joint Chiefs of Staff General Maxwell Taylor calling him "unimpressive," while prominent State Department official Paul Kattenberg derided Tho as a "nonentity." In another project, the village of La Vang in Quang Tri Province near the border with North Vietnam, was the scene of a female apparition in the late nineteenth century. Buddhists claimed that the bodhisattva Avalokiteshvara (also known as Kuanyin) performed the miracle. Diem's brother Ngo Dinh Thuc was the Archbishop of Hue and the foremost religious figure in South Vietnam's nepotistic regime. Thuc declared that the apparition was the Virgin Mary, and ordered that a Roman Catholic cathedral be built in place of the makeshift Buddhist pagoda that occupied the site. Tho made notable financial donations to the project for political reasons. At a farewell dinner for U.S. Ambassador Frederick Nolting in July, Tho called for the Buddhists to be "crushed without pity." He derisively said that Buddhism was not a religion and further claimed that although anybody could become a Buddhist monk, it took years of training to become a Catholic priest. When the Thai ambassador disagreed, citing his own previous monastic training, Tho taunted him in front of other diplomats. With the pressure on the Diem regime increasing during the Buddhist crisis, Nhu and Diem began to shun their cabinet members because they presented arguments contrary to the thinking of the Ngo family. Many ministers attempted to resign, but Tho was credited with persuading them to stay in office. Finding the situation increasingly intolerable, Tho also considered resigning but the dissident generals urged him to remain. They were worried that mass resignations would arouse suspicion of a coup plot. In private, Tho expressed his displeasure with Diem's rule to U.S. officials. He complained of Diem's reliance on Nhu in the running of the country, Nhu's attempt to run a police state through his secret Can Lao party and the lack of success against the Vietcong. During the McNamara Taylor mission to South Vietnam, Tho confided his belief that the country was heading in the wrong direction to the American delegation, imploring them to pressure Diem to reform his policies. He privately revealed his belief that of the thousands of fortified settlements built under Nhu's Strategic Hamlet Program, fewer than 30 were functional. Joseph Mendenhall, a senior Vietnam adviser in the US State Department, advocated the removal of Diem in a military coup and his replacement with Tho. Tho was privately aware that he was the choice of the generals to run the government after the planned overthrow of Diem. After the coup on November 1, 1963, in which Diem and Nhu were killed, Tho was appointed Prime Minister by Minh's military junta. He was the leading civilian in the provisional government overseen by the Military Revolutionary Council (MRC). In addition, he was minister for finance and the economy. Tho's civilian government was plagued by infighting. According to Tho's assistant, Nguyen Ngoc Huy, the presence of Generals Tran Van Don and Ton That Dinh in both the civilian cabinet and the MRC paralyzed the governance process. Dinh and Don were subordinate to Tho in the civilian government, but as members of the MRC they were superior to him. Whenever Tho gave an order in the civilian hierarchy with which the generals disagreed, they would go into the MRC and give a counter-order. Saigon newspapers, which had re-opened following the end of Diem's censorship, reported that the junta was paralyzed because all twelve generals in the MRC had equal power. Each member of the MRC had the power of veto, enabling them to stonewall policy decisions. The press strongly attacked Tho, accusing his government of being "tools" of the MRC. Tho's record under Diem's presidency was also called into question, with allegations circulating in the media that he had supported the repression of the Buddhists by Diem and Nhu. Tho claimed that he had countenanced Nhu's Xa Loi Pagoda raids, attempting to prove that he would have resigned were it not for Minh's pleas to stay. The media further derided Tho for the personal benefits that he gained from the Diem administration's land policy. Minh defended Tho's anti-Diem credentials by declaring that Tho had taken part in the planning of the coup "from the very outset" and that he enjoyed the "full confidence" of the junta. On January 1, 1964, a Council of Notables comprising sixty leading citizens met for the first time, having been selected by Colonel Pham Ngoc Thao. Its job was to advise the military and civilian wings of the government with a view towards reforming human rights, the constitution and the legal system. Tho publicly stated that he expected a "rational attitude" coupled with "impartial and realistic judgments" and said that it was part of the provisional government's quest to "clear the way for a permanent regime, which our people are longing for." The council consisted almost entirely of professionals and academic leaders, with no representatives from the agricultural or labor movement. It soon became engaged in endless debate and never achieved its initial task of drafting a new constitution. Tho later admitted that the Council was unrepresentative of South Vietnamese society and had been a failure. He claimed that the council's desire to move away from the rubber stamp model of Diem's National Assembly had caused it to degenerate into a debating society. With the fall of Diem, various American sanctions that were implemented against South Vietnam in response to the repression of the Buddhist crisis and the attacks by Nhu's Special Forces on Xa Loi Pagoda were lifted. The freeze on U.S. economic aid, the suspension of the Commercial Import Program and various capital works initiatives were lifted. The United States quickly moved to recognize Tho and Minh. Tho's government halted Nhu's Strategic Hamlet Program. Nhu had trumpeted the program as the solution to South Vietnam's difficulties with Vietcong insurgents, believing that the mass relocation of peasants into fortified villages would isolate the Vietcong from their peasant support base. Tho contradicted Nhu's earlier reports on the success of the program, claiming that only 20 percent of the 8,600 existing strategic hamlets were under Saigon's control, with the rest having been taken over by the communists. Those hamlets that were deemed to be tenable were consolidated, while the remainder were dismantled and their inhabitants returned to their ancestral land. Tho's approach to removing Diem supporters from positions of influence drew criticism from both supporters and opponents of the deposed president. Some felt that he was not vigorous enough in removing pro-Diem elements from authority; others felt that the magnitude of the turnover of public servants was excessive and bordering on vengeance. A number of officials suspected of having engaged in corruption or Diemist oppression were indiscriminately arrested without charge, most of whom were later released. Dinh and the new national police chief General Mai Huu Xuan were given control of the interior ministry. The pair were accused of arresting people en masse, before releasing them in return for bribes and pledges of loyalty. Not all officials under Diem could automatically be considered pro-Diem, yet there were calls for further removals of the old guard. The government was criticized for firing large numbers of district and provincial chiefs directly appointed by Diem, causing a breakdown in law and order during the abrupt transition of power. One high profile and heavily criticized non-removal was that of General Do Cao Tri, the commander of the ARVN I Corps who gained prominence for his particularly stringent anti-Buddhist crackdown in the central region around Hue. Tri was simply transferred to the II Corps in the central highlands directly south of the I Corps region. The provisional government lacked direction in policy and planning, resulting in its quick collapse. The number of rural attacks instigated by the Vietcong surged in the wake of Diem's deposal, due to the displacement of troops into urban areas for the coup. The increasingly free discussion generated from the surfacing of new and accurate data following the coup revealed that the military situation was far worse than what was reported by Diem. The incidence of Vietcong attacks continued to increase as it had done during the summer of 1963, the weapons loss ratio worsened and the rate of Vietcong defections fell. The units that participated in the coup were returned to the field to guard against a possible major communist offensive in the countryside. The falsification of military statistics by Diem's officials had led to miscalculations, which manifested themselves in military setbacks after Diem's death. On January 29, General Nguyen Khanh ousted Minh's MRC in a bloodless pre-dawn coup. The civilian arm of the government was disbanded, and thus Tho retired, having personally enriched himself during his period in government. His activities after leaving politics were not recorded, but he was alive in 1992. ↑ 1.0 1.1 Lentz, 831. ↑ 2.0 2.1 2.2 2.3 2.4 Jones, 258. ↑ 5.0 5.1 Jacobs, 95. ↑ 6.0 6.1 6.2 6.3 Hammer, 20–21. ↑ 7.0 7.1 Jones, 276. ↑ 10.0 10.1 Hammer, 136. ↑ 13.0 13.1 Jones, 294. ↑ 14.0 14.1 Warner, 230–231. ↑ 21.0 21.1 Jones, 437. ↑ 22.0 22.1 22.2 22.3 Shaplen, 221. ↑ 23.0 23.1 Shaplen, 223. ↑ 24.0 24.1 Shaplen, 225. ↑ 25.0 25.1 The Overthrow of Ngo Dinh Diem, May-November, 1963 pp. 266–276. The Pentagon Papers. Retrieved February 19, 2009. Hammer, Ellen J. A Death in November. E. P. Dutton, 1987. ISBN 0525242104. Jacobs, Seth. Cold War Mandarin: Ngo Dinh Diem and the Origins of America's War in Vietnam, 1950-–1963. Rowman & Littlefield Publishers, 2006. ISBN 0742544478. Jones, Howard. Death of a Generation. Oxford University Press, 2003. ISBN 0195052862. Lentz, Harris M. Heads of States and Governments: A worldwide Encyclopedia of Over 2,300 Leaders, 1945 Through 1992. McFarland, 1992. ISBN 0899509266. History of "Nguyen Ngoc Tho"
This page was last modified on 7 January 2015, at 17:33.